Also serving communities of Notre Dame, New Carlisle. There are 16 Assisted Living Facilities in the South Bend area, with 8 in South Bend and 8 nearby. The average cost of assisted living in South Bend is $2,883 per month. This is lower than the national median of $3,346. Cheaper nearby regions include Mishawaka with an average starting cost of $2,613. To help you with your search, browse the 90 reviews below for assisted living facilities in South Bend. On average, consumers rate assisted living in South Bend 3.8 out of 5 stars. Better rated regions include Mishawaka with an average rating of 4.2 out of 5 stars. Caring.com has helped thousands of families find high-quality senior care. To speak with one of our Family Advisors about assisted living options and costs in South Bend, call (855) 863-8283. South Bend, Ind., gets it's name from it's location on the southernmost bend of the St. Joseph River. In South Bend, assisted living facilities, officially known as Residential Care Facilities (RCFs), house five or more individuals and provide at least one health-related service and at least two scheduled supportive services. The area is home to 19 facilities, with eight facilities located in South Bend and another 11 located in nearby cities, all licensed and monitored by the Family and Social Services Agency (FSSA) Division of Aging. South Bend's weather can be harsh, experiencing cold winters with lows around 17 degrees Fahrenheit and roughly 64 inches of snow annually. Summers are warm, with a July high of 83 degrees Fahrenheit. The air quality in South Bend in poor, which may pose a problem for seniors with respiratory illnesses. The American Lung Association rated the city 36th out of 227 metropolitan areas for high ozone days, 17th out of 201 metropolitan areas for 24-hour particle pollution and 33rd out of 187 metropolitan areas for annual particle pollution. South Bend is an affordable place to live, with an overall cost of living 8 percent lower than the state average and nearly 23 percent lower than the national average. While the low costs of housing and utilities are the primary factors in this figure, seniors can expect to pay 5 percent less on groceries and roughly 3 percent less on transportation than they would elsewhere. South Bend has reliable public transportation courtesy of Transpo, which operates 17 routes throughout South Bend and Mishawaka. Seniors can show their Medicare card to receive a discount on their fare. South Bend has a crime rate 104 percent higher than the state average and 115 percent higher than the national average. The rate of violent crimes is 152 percent higher than the state average and 164 percent higher than the national average, and the property crime rate is 96 percent higher than the average for Indiana and 107 percent higher than the U.S. average. The South Bend area is home to world-class medical facilities, including Memorial Hospital, in the event of medical emergencies or illness. Assisted Living costs in South Bend start around $2,883 per month on average, while the nationwide average cost of assisted living is $4,000 per month, according to the latest figures from Genworth’s Cost of Care Survey. It’s important to note that assisted living rates in South Bend and the surrounding suburbs can vary widely based on factors such as location, the level of care needed, apartment size and the types of amenities offered at each community. Qualifying low-income seniors in South Bend may be able to receive financial assistance from state and federally funded programs to help pay for their care. 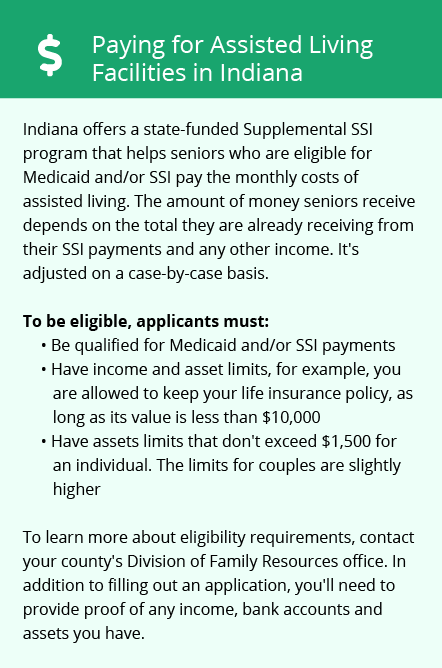 Currently, there are four programs available: Indiana Medicaid, the state’s Medicaid Aged and Disabled 1915 ( c ) Waiver program, the Indiana Residential Care Assistance Program (RCAP) and Supplemental Security Income – Category G.
South Bend and the surrounding area are home to numerous government agencies and non-profit organizations offering help for seniors searching for or currently residing in an assisted living community. These organizations can also provide assistance in a number of other eldercare services such as geriatric care management, elder law advice, estate planning, finding home care and health and wellness programs. To see a list of free assisted living resources in South Bend, please visit our Assisted Living in Indiana page. 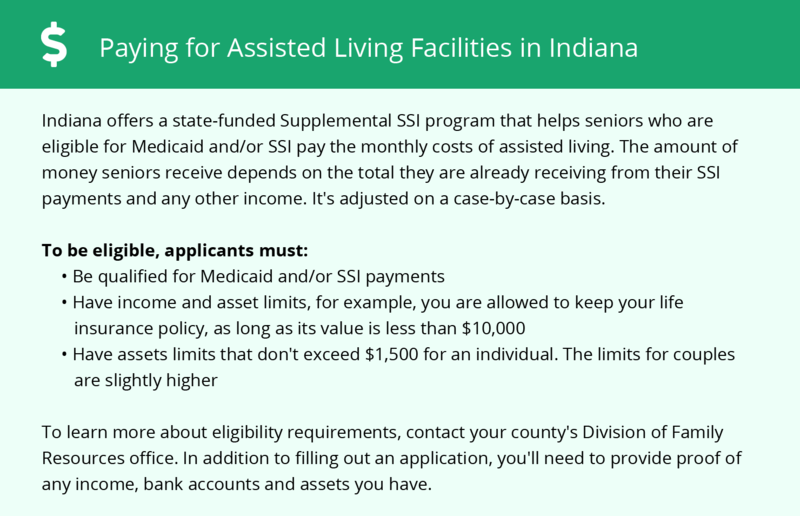 South Bend-area assisted living communities must adhere to the comprehensive set of state laws and regulations that all assisted living communities in Indiana are required to follow. Visit our Assisted Living in Indiana page for more information about these laws.